Pete Satre, Corporate Manager of Engineering at Allied, co-authored an article for Foundry Management & Technology that discusses reducing “the build up” situation in a coreless furnace with well controlled fluxing. 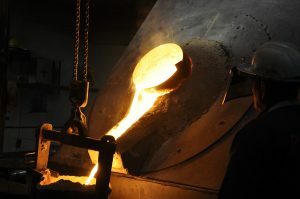 In all coreless induction furnaces, there is an “ideal” refractory wall thickness, carefully calculated by the furnace manufacturers for optimal melting performance. This calculation includes safety considerations, electrical characteristics of the coil, metallic charge resistance / electrical conductivity, structural and refractory considerations, operational constraints and production needs. When the furnace melt diameter is reduced by buildup, the melting process efficiency becomes compromised. The result is a reduction in the percent power utilization and energy consumption increases. To view the full article, go to Foundry Management & Technology.